BOCA SHORES - Rare 2 BR, 1 BA water side property with balcony view of water! A great second home or rental. Bright and cheerful environment. Fully furnished in tropical decor, updated kitchen, laminated counter tops, open floor plan, tile floors, crown molding and six panel doors. Bathroom is updated as well. Elevator is steps away from the unit. This unit is close to the pool, and all water amenities. Boat slips can be leased at a very affordable rate when available. Maximum boat length allowed is 32 feet. Special fishing dock with cleaning table for the fishermen. Sun on the sun deck or at the pool and enjoy the beautiful view of the Intracoastal Waterway. Join the friendly residents out at the heated pool. Or play some pool in the clubhouse. Indoor bicycle storage is available for owners. 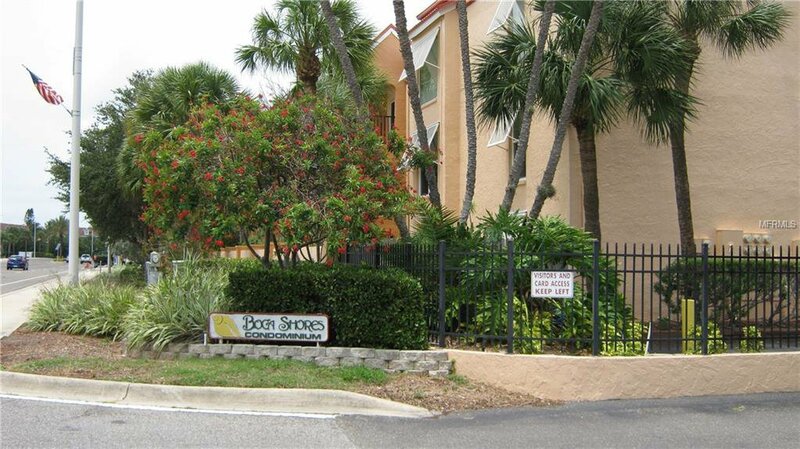 Boca Shores is a gated, and well maintained, lushly landscaped complex. Walk around the bend to the beach (1/2 mile) some popular restaurants, a dog park, community park by the water with fishing dock, or get a pedicure. Excellent location with easy access to many amenities in the Tampa Bay area. Property is being sold AS-IS. SELLER SAYS BRING OFFERS! Don't miss out on this fabulous opportunity!!! Listing courtesy of LUXURY & BEACH REALTY INC. Selling Office: LUXURY & BEACH REALTY INC.